Here's one of our sliding windows installed in a Back Cove 37', custom made to compliment the traditional elegance of the Back Cove design. 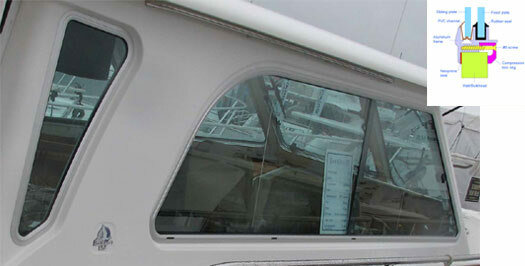 The fixed panel, 0.25"(6mm) thick tempered glass, is compression mounted in a rubber U channel. The sliding panel, 0.25"(6mm) thick tempered glass is mounted in PVC wiper track for improved sliding and drainage, vertical and upper tracks have HD weatherseal. Vertical rubber seal(s) are installed at mullion to prevent water ingress from weather coming from stern. Sliding windows are weatherproof, NOT waterproof. If used in adverse conditions , window lay-out will effect water ingress. Consult us regarding design to reduce/eliminate possible water ingress. Sliding windows can be produced as horizontal sliders, half drops (sliding plate opens from top down) or guillotine type (sliding plate opens from bottom up). Removable screens are also available as an option.